a 16 bit color scheme for hackers. then in your ~/.vimrc add colorscheme sourcerer and turn :syntax on. 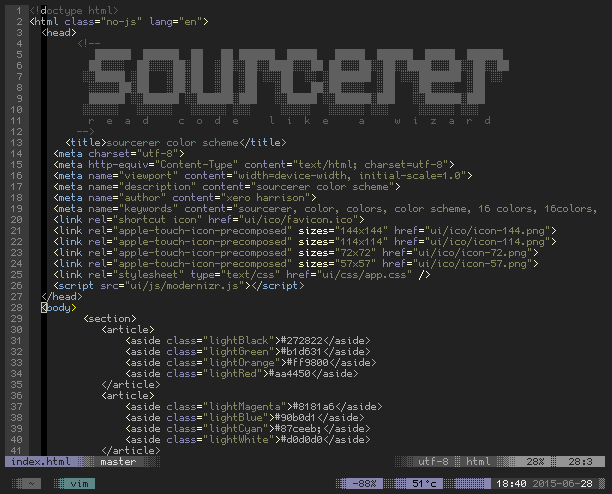 copy the contents of sourcerer.Xresources into your ~/.Xresources or ~/.Xdefaults file. your system may require you to call xrdb -merge ~/.Xresources and/or restart your terminal emulator. copy sourcerer.sh into your home directory and add source ~/sourcerer.sh to your shell init script ~/.bashrc or ~/.zshrc. colors will only be applied in a new tty session. launch iterm/item2, type CMD+i, navigate to Colors tab, click on Load Presets, click on Import and select sourcerer.itermcolors. copy sourcerer.py to your styles directory, ususally /usr/lib/python3.5/site-packages/pygments/styles. then set the style when you use the command: pygmentize -O style=sourcerer -f console256 -g (make it can alias like ccat or c).